Done! This made enough for me to pop some in a container and use as a dip and also cook up some zoodles and toss the sauce through with some cherry tomatoes. Yum!! Parsley is very highly regarded in Ayuveic medecine due to it’s effect on the digestive system. It is a natural diuretic, but it allows for the excretion of water to flush out toxins but does this without losing electrolytes. It also increases the body’s ability to absorb magnese and is high in Eugenol, an oil that naturally decreases unwanted bacteria in the gut and we all know a healthy gut bacteria is the key to a healthy body and mind! Basil is also regularly used in Ayuveic medecine and helps to cleanse the respiratory tract, in turn reducing bloating and gasses. It is also a strong antiseptic and fights agains bacteria and parasites. Basil is very high in antioxidants which help to reduce the effects of stress on the body, which will in turn help to lower cortisol levels and inflammation – perfect to help with skin conditions such as ezhema, psoriasis, irritable bowel etc. 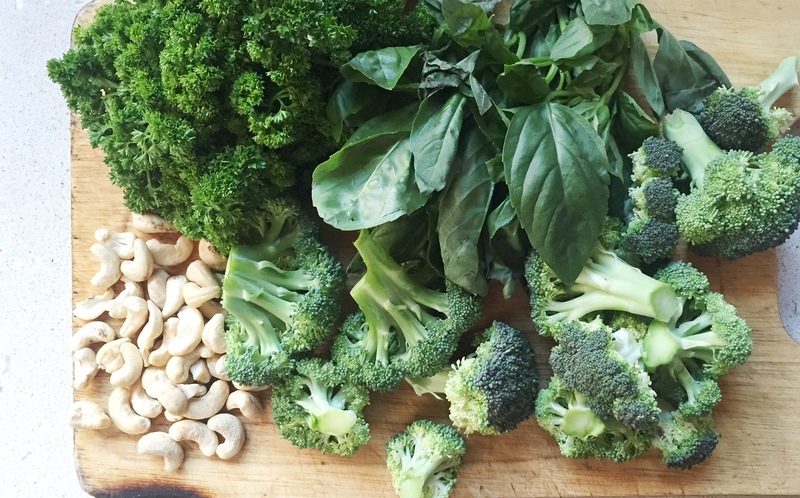 We all know that broccoli is a superfood, but why?! Broccoli can lower your cholesterol – it binds with the bile in your stomach and makes it easier for acids to be excreted, which results in lower cholesterol levels. Broccoli is also high in vitamins K, A and D. Many people are deficient in vitamin D, and eating your vitamins is much more beneficial for the body than taking supplements. It is also high in flavonoids that help to reduce inflammation. This combined with the Euganol in the parsley makes this pesto recipe one that is truely GOOD for your body!